The production of Shakespeare's Much Ado About Nothing now on stage at North Coast Repertory Theatre in Eureka is light on its feet. The action and the language move swiftly and intelligibly. There are basically two stories to tell: the melodramatic tale of false accusations made against a noble's daughter that disrupts one love affair, and the more comic battle of wits of another couple, who are nevertheless destined for each other. It is the interplay of this latter couple --Beatrice and Benedick -- that gives this play its enduring fame. The mixture of these stories makes this play unique. Both stories begin lightly, with the return of soldiers after a war. A wealthy landowner, Leonato (played by James Read), his daughter, Hero (Jennifer Trustem), niece Beatrice (Kimberly Haile) and brother Antonio (Scott Osborn) greet these soldiers, who evidently had been stationed there before: the prince Don Pedro (Bobby Bennett), the young Claudio (Evan Needham) and Benedick (Ethan Edmonds.) Lurking in the background is Don John (David Hamilton), the surly villain of the piece. As Beatrice and Benedick continue their "merry war" of witticisms aimed at each other, Claudio falls in love with Hero. When this match seems assured, the others set about tricking Beatrice and Benedick (in a couple of madcap scenes) into realizing they love each other. But both stories turn serious at the aborted wedding of Claudio and Hero, after Claudio and Don Pedro have been deceived by agents of Don John into believing Hero is unfaithful. It is to the particular credit of veteran actors Bob Service and especially James Read that this scene is credibly powerful; Evan Needham is also notably effective. This crisis brings Beatrice and Benedick together, and after much more ado, the play ends happily with promises of several repetitions of "I do." The roles of Beatrice and Benedick (who W.H. Auden called Shakespeare's most likeable characters) have attracted many famous actors through the centuries, including Emma Thompson and Kenneth Branagh in 1993 in what for my money is among the best movies made from a Shakespeare play, and the former Doctor Who tandem of Catherine Tate and David Tennant in a British stage version last year. In this production, Kimberly Haile's performance as Beatrice is bold, quick, vivid and broad. With light movements and line readings that are natural and nuanced, Ethan Emmons is a superior Benedick. Though very different in style from his recent role in Look Back in Anger at Ferndale Rep, his performance here is again reason enough to see this show. Among the generally solid supporting cast, Charlie Heinberg as the drunken conspirator Borachio had an especially affecting scene. Other cast members not named so far are Katy Curtis, Wesley Fuller, Marin Griffin, Zoe Helton, Megan Johnson, Ed Munn, Alex Service, Pam Service, Keili Simmons Marble and George Szabo. The production is uneven, and the Benedick and Beatrice relationship didn't seem to me to quite find its heart until very late. But apart from some lapses of taste that might spoil this soufflé for some viewers, it is inventive and enjoyable. Director Calder Johnson creates a credible world and mostly equips his actors to succeed. Though the period is awkwardly but not fatally changed to the 1940s, Shakespeare's location of Sicily is retained, by which the Bard basically signals that the characters are more passionate than the English. The set by Jody Sekas suggests a Latin village timelessness, and David Kenworthy's lighting keeps it sunny. Keili Simmons Marble choreographed the handsome dances, though the recorded music is woefully inadequate. JM Wilkerson designed sound, and costumes are by Megan Johnson, Calder Johnson and Jennifer Trustem. 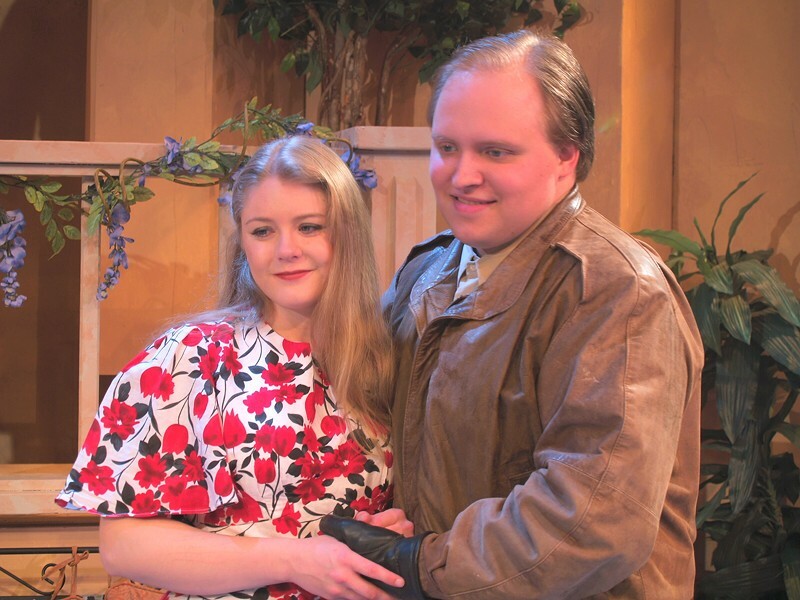 Much Ado About Nothing plays weekends at NCRT through April 21. Toronto's internationally acclaimed Faustwork Mask Theater presents The Mask Messengers, a set of comic and dramatic vignettes inspired by the assembled masks, at the Arcata Playhouse on Friday and Saturday (Apr. 6 and 7) at 7 p.m., and 2 p.m. also on Saturday, as part of the Playhouse Family Fun series. The Dell'Arte Company presents a New Works Cabaret, Friday through Sunday (Apr. 6-8) at 8 p.m. in the Carlo Theatre. A variety of brand new work will feature Stephanie Thompson, Joe Krienke, Lauren Wilson, Joan Schirle, Zuzka Sabata, Barney Baggett and more. Speaking of Dell'Arte, its International School is the subject of a scholarly article in the March 2012 issue of Theatre Topics, a publication of Johns Hopkins University Press in cooperation with the Association for Theatre in Higher Education. The article is by Claire Canavan, a lecturer in the University of Texas Theatre and Dance Department, and is based partly on her experience as a student in a four-week summer intensive at Dell'Arte in 2009. She notes a "productive tension between the idea that the actor is an artist with an original point of view, and yet that artistry and point of view are developed specifically through ensemble and community." She writes that the Dell'Arte program stands out in how it "envisions the role of the actor in theatre and also the role of the actor in society."